This is a must see! Christopher Plummer gives an Academy Award winning performance. This is a sweet and creative movie about life. Touching with a clear message. It’s never too late! If you missed this in the theater, then get the DVD from Amazon.com where I buy all my DVDs . This one’s a keeper. White frames, White walls, White lights, and “100 Headless Women” is the topic for Max Snow. This talented photographer is exhibiting his concept at Kathleen Cullen Fine Arts from March 2nd to April 7th. These bold images are beautiful and mysterious on so many levels . The large scale of these photos are magical. I want one on my wall now! Run to see this show and the wonderful transformation of these Goddesses. Books, Books, Books, Skulls and more Skulls. The fashion world is still obsessed with this long-lasting trend and so am I!! 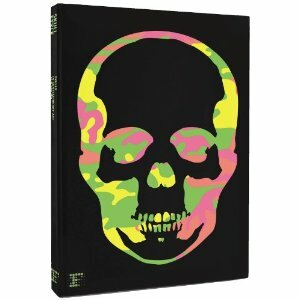 Skull Style is a new book with a cover designed by the famous bad-boy of cashmere Lucien Pellat- Finet. Remember his sweaters with skulls and marijuana leaves woven into them? This book has three different covers, and I’m crazy about the neon-camo version. This tomb seems mesmerizing and I can’t wait to get my hands on it. Skulls are cool and everyone knows it. Black is where it’s at! Run to the Steven Kasher Gallery in New York to see this wonderful photography show. I was lucky to go to the opening and meet the artist. He has dug up these wonderful images of his friends in New York City from 1970 -1973. I was amazed to see the flamboyant and creative Harvey Fierstein in one of the images. I never knew him as part of an “in crowd.” These photos have a painted quality which gives them a dark and eerie feeling. 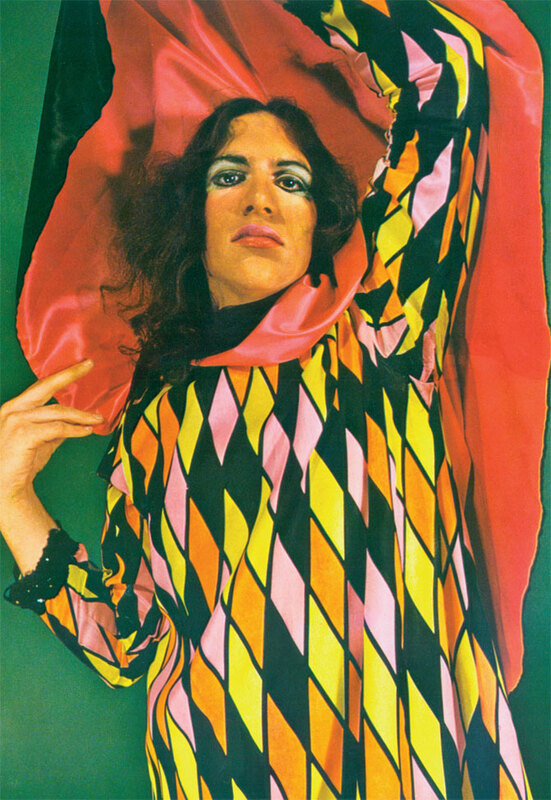 The 70’s never looked so explosively liberating ! “If you got it then flaunt it!” That seems to be the rage in these wildly colorful photographs. The suite was on the 17th floor of the Queen Elizabeth Hotel in Montreal. The date was May 26th to June 2nd 1969. 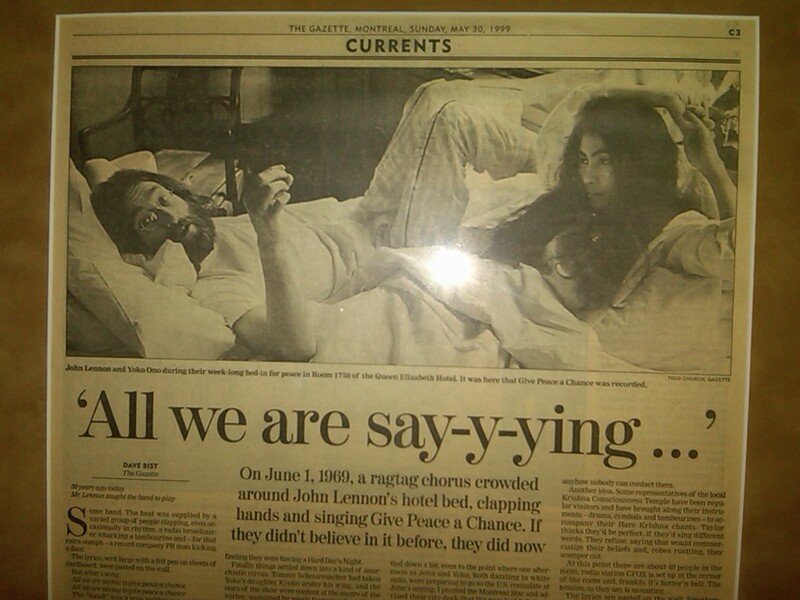 John and Yoko stayed in bed for 8 days in order to “Give Peace a Chance.” I recently went to this hotel on vacation, and noticed this book on the counter. 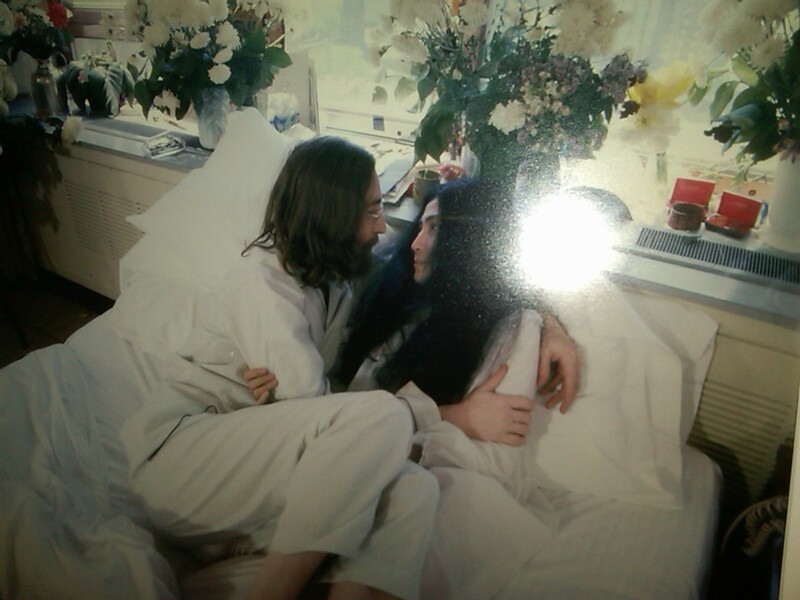 Why John and Yoko? 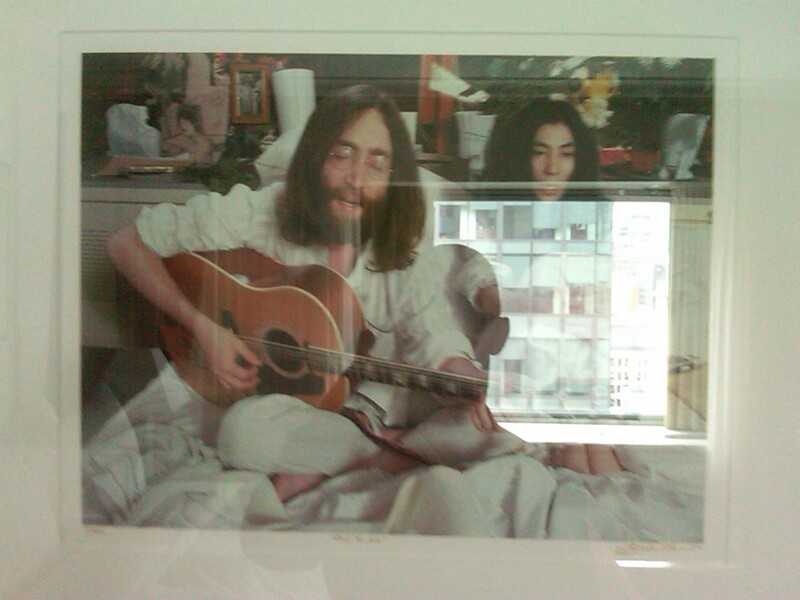 So I asked and they immediately escorted my friends and myself up to see the “John Lennon Suite.” This is where I took these photos on the walls. It was all set up as it was in 1969 except the position of the bed had been moved. I was thrilled to see history right before my eyes and under my feet. I ran to buy this book for my collection and the memory. This is a great holiday gift with warmth and feeling. A great price for a remarkable memorable and moving chronicle of that wondrous event. BTW, this book also comes in French! Savage Beauty. . . The exhibit has ended. The crowds are gone. The lines have disappeared. The Man who was supposed to be made of Metal has passed on. All we have is the photos, the dresses, the history, the great fashion moments of a man who was a bad boy and a dark romantic. His SAVAGE BEAUTY is one to be remembered and stored in the houses of geniuses. Alexander McQueen made a short mark but a GIANT leap into the minds and hearts of everyone he touched through the beauty his talent exuded. This book is the real deal! Gritty and visionary, fragile and tough. 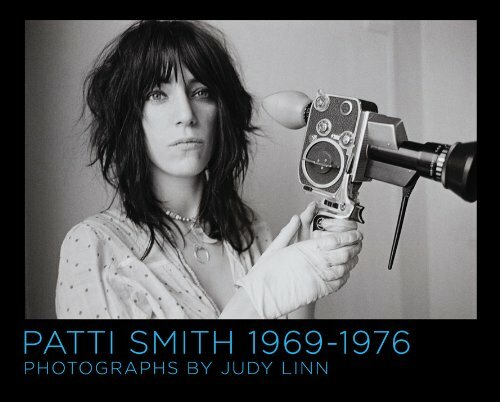 The photographer Judy Linn takes some wonderful photos that captures this time frame in the life of Patti Smith. Each photo tells a story and you feel like you are inside at the location. The photos detail the landscape so well, that you understand the time and place and frame of reference. Robert Mapplethorpe appears in over 12 photos as well which is a wonderful addition to telling the reader about this period in the 70’s. Patti writes the afterword to this book and gives you a deeper understanding. I was lucky to see this exhibit at Feature Gallery and purchase the last signed book by both Judy and Patti. It made my day!